Revenge of the Girl with the Great Personality by Elizabeth Eulberg. Scholastic, 2013. Available March 1. Face Value: The lipstick-written title has been done before, but it’s fitting in this case. This book is all about the ways in which we mask ourselves with artificial means. It’s also a little bit rebellious – using the lipstick the put into words something that has been hidden. Yep, totally appropriate for this book. Does it break the slate? Tough call. Lexi veers from one end of the spectrum (hating artificial beauty and eschewing makeup and fashion) to the other (spending hours on her appearance daily) throughout the book. She ultimately comes to a middle-ground stance regarding makeup, clothes, and what they mean for her – but it’s not an easy journey to get there. Although not all of the choices Lexi makes are Slatebreaking, I think she’s an example of a female character that would feel authentic to most teen readers. It’s not easy to make a feminist choice – especially in a small, conservative high school. Lexi can help readers feel more at ease with their own conflicting ideas about appearance. She’s an example of a young woman who learns through trial and error and grows stronger through those experiences. Who would we give it to? This is a book for sisters who feel overshadowed. I’ve you know any sisters who wish they could shine as bright as their siblings, they will find a friend in this book. It’s also a thought provoking book for girls who feel awkward about their appearance. That was definitely me in high school, and I know I’m not the only one who attempted to define myself through clothes and makeup and ended up looking like I was trying too hard. Review: There’s a lot of hometown pride that goes along with this book, so let me get that out of the way first. Elizabeth Eulberg is from Portage, WI – that’s where I grew up! Although I have not met Elizabeth, I do know her mom. Mrs. Eulberg was the library media specialist at my high school and was one of my favorite adults during my teenage years. I went to book club with Mrs. Eulberg, spent countless hours chatting with her in the library, and even had her as my confirmation sponsor. It’s no surprise to me that Mrs. Eulberg, a confident and intelligent woman, raised a daughter who turned out to be an author. And to see someone from Portage have a successful YA writing career inspires so much pride and excitement that I pretty much squee every time I think about it. Ok, now we can talk about Revenge of the Girl with the Great Personality. This is Eulberg’s fourth novel, and the first one that I’ve felt was a good fit to review on Slatebreakers. 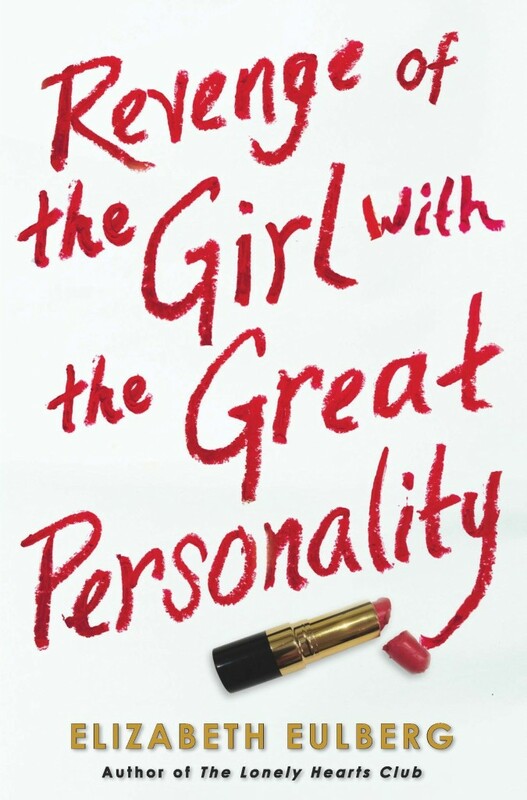 The book focuses on a smart and funny girl, Lexi, who is sick and tired of being described as the girl with a “great personality.” Although she realizes that appearances aren’t everything, she dislikes being overshadowed by the flighty and superficial girls who get more attention because they spend a lot of time making themselves look good. The premise intrigued me. How would this book deal with this extremely complicated topic without veering badly off the path of female empowerment? Lexi’s story is not a typical duckling-to-swan transformation. Lexi has a younger sister who is deeply entrenched in the pageant circuit. Lexi’s family spends most of their free time supporting Mackenzie’s pageant habit. Lexi also has an obese mother whose weight has become a major health concern. These factors complicate the plot, and make it much more nuanced than I expected. I was prepared for a Mean Girls style story, but I got much more than that out of this book. Meanwhile, while Lexi is experimenting with her appearance, her home life is in disarray. Her family can’t pay the bills because of all the cash her mom sinks into pageants. Lexi and her mother are at odds. Her father, who split from the family years ago, is not supporting his daughters emotionally. Lexi isn’t always the nicest person while navigating her family dynamics. Although she often argues the “right” side of the situation (or at least the viewpoint with which the reader is more likely to agree), she does so in a way that alienates the people she loves. At times, I really disliked Lexi. I wanted her to calm down and find a reasonable way to bring about changes in her home situation. Yet these flaws make Lexi human, and a believable character. This book has a messy ending. Not messy as in “the author didn’t tie up all the loose ends,” but messy in the sense that Lexi has to live with regrettable consequences to some of her choices. But that’s life, really. I’m glad that Eulberg didn’t tie up everything into a neat and pretty bow. There are loose ends in Lexi’s life that will take more effort, more patience, and more self-reflection. Revenge of the Girl with the Great Personality reminds readers that our choices have consequences, and that we need to think about the relationships we nurture and the relationships take more than we can give. This is a refreshingly honest book about the ins and outs of appearance-based cultural norms. Reviewed from ARC received via NetGalley. This entry was posted in Reviews, Young Adult and tagged appearance, beauty, Family, pageants, Siblings. Bookmark the permalink. I really want to read this one, and I’m glad it passed a slatebreaking review fairly well, and was a nuanced story!